It stems from the chairman's comments that U.S. intelligence "incidentally collected" information about Trump transition members. "These actions simply raise enormous doubt about whether the committee could do its work," Rep. Adam Schiff said. Earlier Wednesday, House Intelligence Committee Chairman Devin Nunes held two press conferences and briefed President Trump on information he hadn't shared with Schiff or any other committee members. Nunes said he received intelligence reports indicating U.S. intelligence "incidentally collected" information about Trump transition team members — and possibly the then-president-elect himself — while conducting foreign surveillance. Based on the "dozens" of reports Nunes read, most of the collection occurred after the November election into January. Nunes said the communications appeared to be "obtained legally." But he said he has some concerns. A reporter asked, "Are you saying that it was political surveillance of political opponents that the president has suggested in his tweets?" Nunes replied, "What I've read bothers me, and I think it should bother the president himself and his team because I think some of it seems to be inappropriate." Nunes later said, "There are things to me that don't reach the level of foreign intelligence value. And if that's the case, you have to ask yourself, 'Why did those end up in reports?'" 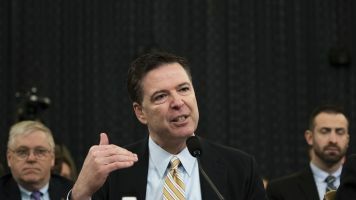 His statement came two days after FBI Director James Comey said there was no evidence to support Trump's allegations that Trump Tower was wiretapped by the Obama administration. When asked by reporters about the information divulged by Nunes, Trump said he felt "somewhat" vindicated about the wiretapping claims. "On the basis of what the chairman has said and on the basis of my conversation with the chairman, I can say this: There is still no evidence that the president was wiretapped by his predecessor," Schiff said. Nunes said it appeared more names of Trump transition officials than previously known were unmasked. "There's additional unmasking of names, which I think is totally inappropriate ... and then you have the issue of the names that were put into these intelligence reports," Nunes said. Schiff said he expressed his "grave concerns" about how Nunes conducted himself Wednesday to the chairman himself. And he told reporters he didn't think more names were necessarily unmasked. "As I understand from my conversation with the chairman, most of the names in the intercepts were in fact masked, and the chairman's concern was that he could still figure out the identities of some of the parties even though the names were masked. Well, that doesn't mean that the masking was improper," Schiff said. Nunes said the surveillance had nothing to do with Russia or the investigation into Russian election activities. But Schiff didn't think it was appropriate for Nunes to share the information with the president. "If you have a chairman who is interacting with the White House and sharing information with the White House when people around the White House are the subject of the investigation and doing so before sharing it with the committee, it throws a profound a doubt over whether that can be done credibly," Schiff said.